A programme of networking events throughout the year, at venues & times to suit you. Expand your network, reconnect with old colleagues & attend free educational seminars. Then you should coming along to gdb's Express networking lunch. This lunch allows you to network with quality businesses whilst grabbing a bite to eat. 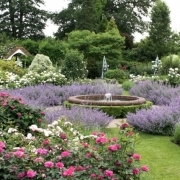 Drop in at any time between 12-2pm in the beautiful surroundings of Borde Hill Gardens. After this date, your booking is transferable to another person, but there are no refunds.